This year's 5.8- and 6.5-inch OLED iPhones will support the Apple Pencil, an accessory originally designed exclusively for iPads, a report claimed on Thursday. The rumor comes from "industry insiders" cited by Taiwan's Economic Daily News. This echoes a claim made by research firm TrendForce earlier this week, but that one did not specify which iPhone models might have Pencil support. On top of the OLED iPhones, Apple is also expected to release a cheaper 6.1-inch LCD model this fall. Gating Pencil support could be one way of pushing people towards more expensive hardware. Late Apple co-founder and CEO Steve Jobs famously said that "nobody wants a stylus" when he revealed the first iPhone in 2007, arguing that no one wanted to bother with taking one out and putting it away, or risk losing it. At the time, however, Jobs was reacting to the state of touch-based smartphones, many of which used stylii to get around precision and sensitivity problems. 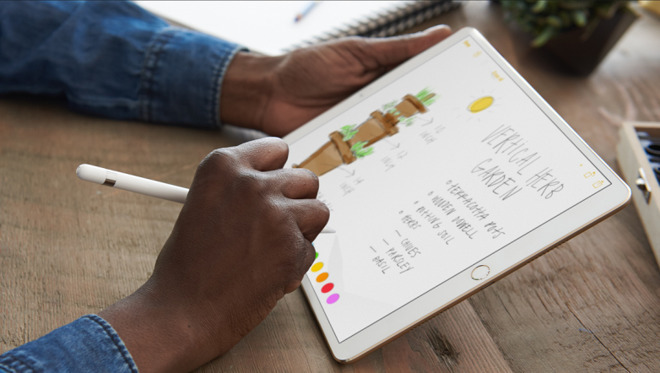 The Apple Pencil is intended to expandtouch control options rather than serve as a main input scheme, making it easier to draw, edit images and text, or write notes. That usage could make sense on large iPhones with edge-to-edge displays, but there would be a few obstacles. Any device would have to support the Pencil's low-latency technology, and Apple would presumably want to build a smaller version of the stylus, given that it would be awkward or even dangerous to keep the full-sized version in a pants pocket. Even then, Apple might be compelled to design a new iPhone case with a Pencil holder, rather than force people to keep the accessory loose. The move would put iPhones in more direct competition with Samsung's Galaxy Note 9, which not only comes with a stylus but has a special slot for storage and charging. The S Pen can even be used for tasks like triggering photos, controlling media playback, and running slideshows.